In stock. Order in the next 10 hours, 1 minute and it will go out today! 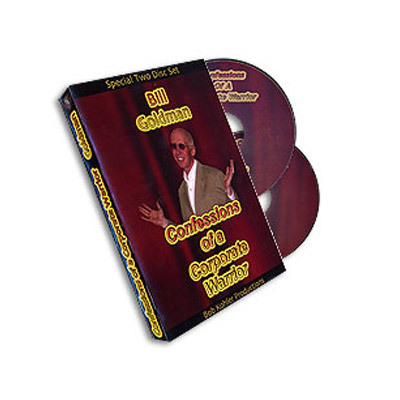 This landmark DVD set by Bill Goldman will instantly become the most important reference for trade show magicians. What makes a Corporate Warrior? Over twenty years of performing thousands of shows for Fortune 500 companies! Bill Goldman has traveled the world performing at trade shows, hospitality suites, sales meetings and after dinner banquets! This special two DVD set documents an incredible Inner Circle trading session between Bill and four working professionals. Bill's conversations with Tim Noonan, Brian Irwin, Bram Charles, and Jason Bird tip it all. You'll learn the real work that only years on the road could teach you. The guys ask all of the right questions that extract every possible piece of information from the center of Bill's brain. It's the stuff nobody ever talks about! With a running time of 2 hours and 45 minutes, the two DVD set contains extremely valuable information on scripting, trade show pitches, premiums, length of performance, give-a-ways, stopping traffic, building crowds, marketing, promo videos, payment strategies, and so much more. The presentation is in a refreshing conversational style that is often as hilarious as it is educational and inspiring! A Ton Of Hilarious Goldman Stories!